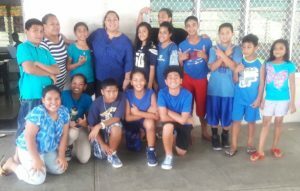 INSPIRE’s “Wear All Blue” Colorectal Cancer Awareness – DAY 7 with teacher Sarai Fanene-Lemalu and several students from Aua Elementary School. Aua Rainmaker Elementary School is a coeducational public school for students in grades Pre-K through 8. Their school colors are purple and the school sits right below mount Pioa known as the Rainmaker Mountain. Thank you Sarai and Aua students for sharing your “Wear All Blue” with INSPIRE and supporting the American Samoa Community Cancer Coalition in helping the people of American Samoa fight cancer.